First flown on 1st March 1955, WT741 was built as an F.4 and delivered to the RAF on 28th March 1955. She was later converted to a GA.11 and transferred to the Royal Navy and 738 NAS in 1967, but retired by February 1970. She was bought back by Hawkers and converted to a T.75A twin-seater for Singapore (serial 544), with her original single seater nose retained in storage. 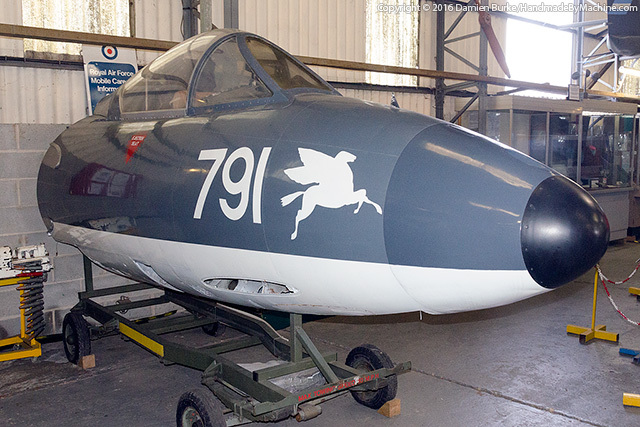 The nose ended up at the Hemswell museum and when that folded, transferred to Aeroventure. She's seen there in her last active colours - those of 738 NAS.